That caught me by surprise as I was under the impression that you couldn’t get better known in the printer world than Mutoh. So, for those of you who aren’t familiar with Mutoh, let me tell you about them. Mutoh (pronounced Moo-Toe) is the second largest printer manufacturer in the world, behind HP (but Mutoh is ahead of HP in the outdoor printer category). branded printers, they build printers for Fuji, Gerber, Kodak, Xerox, Epson, Oce and more, including the SIGNWarehouse Exclusive 48″ PrismJet VJ48 Plus (aka Mutoh 1204G), PrismJET VJ24 (aka ValueJET 628), and the 54″ PrismJET VJ54. All of these top-selling PrismJET models offer unique benefits. The VJ48 Plus is so named because it is the only wide format printer capable of printing on standard inkjet media Plus pre-hemmed and pre-grommeted banner media. This is an enormous advantage in a busy shop because it eliminates the need to manually hem and grommet printed banners. The PrismJET VJ54 is the industry’s best value in large format printing. 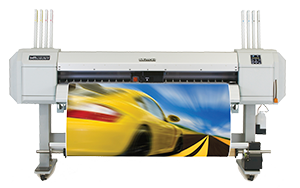 It offers the standard 54″ media width for maximum versatility and comes with RIP software and an automated media take-up system at the lowest price point in the MUTOH family. The PrismJET VJ24 is the most efficient 24″ eco-solvent printer in the market. It compacts the firmware and print modes from the 54″ ValueJet into a space-saving but productive package yielding print speeds of over 400 square feet/hour. The recent announcement of the addition of the 628X model with white and metallic ink and an internal ink recirculation system will only make it more versatile and more appealing to sign makers and garment decorators. Mutoh is an ISO 9000- certified manufacturer with class-leading quality control and reliability; which is why so many other top tier companies rely on them. Based on information from companies whose business it is to provide on-site warranty service for large format printers, the Mutoh ValueJet is twice as reliable as other large format inkjet printers. Mutoh’s genius lies not just in building a better printer. 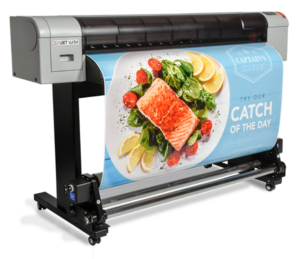 Mutoh’s product line combines consistent refinement with innovative new products to create new business opportunities for end users like you. This is reflected in the fact that Mutoh has won the prestigious SGIA Product Of the Year Award two years in a row with the ValueJET 1638 and 2638. At the 2016 SGIA EXPO, Mutoh took home three Product of the Year Awards for the ValueJET 1628X, 1638UH UV-led printer and 1938TX textile printer. Industry leaders recognize Mutoh’s class-leading performance and value. Today, the Mutoh America product line includes small and large format printers for vehicle wraps and commercial signage, small and large format UV-LED printers for awards and prototyping, large format flatbed printers for direct-to-substrate signage and packaging, and several textile print solutions ranging from dye sublimation to direct to garment. 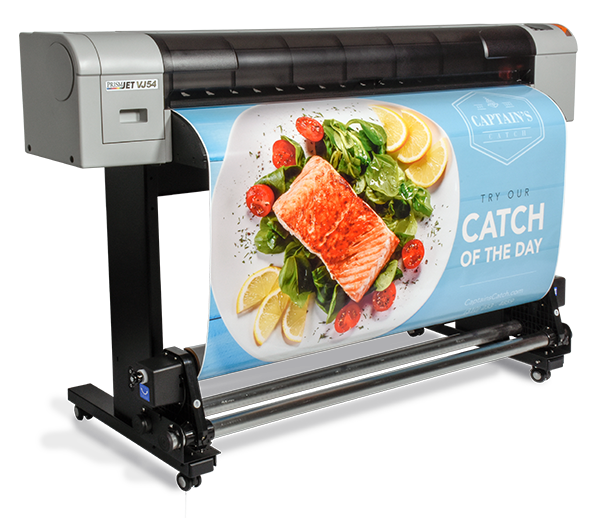 Mutoh utilizes the latest Epson single-head technology and smaller ink droplet size than other manufacturers. This supports higher resolution and smoother gradients. But Mutoh print quality goes beyond the quality of the Epson print heads. 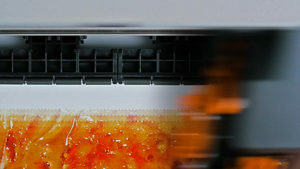 Mutoh pioneered and patented a unique print algorithm called “Intelligent Interweave” (we call it “Wave Printing”) that lays down ink in overlapping waves. Intelligent Interweave or I2 offers several benefits. First and foremost, wave printing virtually eliminates the “piezo banding” problems that plague other printers using the same print head technology. Click here for a comprehensive explanation of the benefits of wave printing by Nicholas Helmuth, author of the FLAAR Reports. In addition to removing troublesome banding issues, wave printing allows end users to produce high resolution prints at speeds that sued to require the uses of two or three print heads. Being able to produce high speed and high resolution with a single head makes the printer more reliable and economical. Finally, the genius of wave printing is that it makes good quality so much easier that the PrismJET and ValueJet printers are much less dependent on media-specific ICC Profiles. The ability to use a few generic profiles for most vinyl and banner work simplifies your life and boosts productivity. If you prefer to go in the other direction and tightly control your color management, Mutoh has a solution for you as well. Several ValueJET models, including the PrismJET VJ54, offer an optional on-board spectrophotometer that supports creation of custom profiles and supports the output of consistent color through changes in media and environmental conditions. Mutoh adds to all of these brilliant hardware advantages by adding Smart Printing software like the VSM virtual status monitor. VSM allows you to connect with and manage your ValueJET printer remotely using your iphone or Android phone. It’s the ideal app for the busy sign shop owner who needs to be in two places at once. Mutoh and Roland printers use the same odorless, no-VOC ink, but Mutoh lays it down in a 3 picolitre ink droplet compared to Roland’s 6 picolitre droplet. This tiny ink droplet enables a 4-color printer to produce gradients, shading, flesh tones and pastels typically only found in 6-color printers with larger droplets. Mimaki uses a mild-solvent ink that differs from Eco-Solvent. Mimaki ink produces an odor and can present more maintenance issues than eco-solvent inks. Mimaki and Roland build good large format printers. I’d never say they don’t. Mutoh simply builds better printers. The specifications are better in most every respect. Mimaki and Roland simply cannot produce the same print results at the same speeds in the same class of printer. The HP Latex product line has made some inroads based on the promise of immediate lamination of printed materials. Based on customer experience, these claims are overstated. As are some of the claims made against eco-solvent printers in HP sales literature. Industry analytics based on actual output have shown that most sign businesses who purchase a Latex printer already have an eco-solvent printer on hand – and that they use the eco-solvent machine more than the HP Latex printer. Perhaps HP’s claim of increased productivity leaves something to be desired in real world sign production. The biggest difference between MUTOH and HP printers is in the print heads. MUTOH and PrismJET printers use advanced piezo-electric print head technology while the HP latex printers are hobbled with outdated thermal inkjet heads. For more about how MUTOH’s piezo print head technology compares to HP, please refer to our recent blog article. So, don’t be fooled by familiar brand names and big marketing budgets. In the world of outdoor large format printers, Mutoh is the leader, when compared to the Roland, Mimaki, and yes, HP. Mutoh has wave printing to eliminate banding, a feature not found on any other branded printer. The specifications are better in most every respect. Mimaki, Roland, and HP simply cannot produce the same print results at the same speeds in the same class of printer with the same reliable output, day in and day out. For industry-leading quality, precision, innovation, and reliability, the smart money is on Mutoh.